Last week I detailed Kona Ironman age-group champion Dan Plews’ daily and training nutrition using a LCHF approach. How does this change in the lead up to an event, and what does he do on race day? Like conventional sports nutrition principles, there is somewhat of a carbohydrate loading phase pre-race. 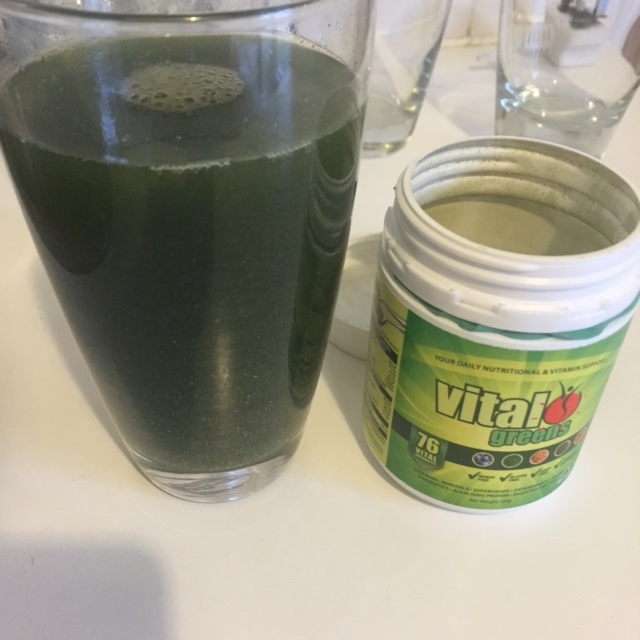 This isn’t the 500-600g of carbohydrate that is recommended for most athletes in the three days before (which generally leaves an athlete feeling lethargic and bloated), however it is more than he would generally eat. Don’t forget that tapering for a race is, in effect, carbo loading, as the muscle glycogen stores are not depleted during training and it allows them the chance to be replenished and not in the deficit they normally are. Based on Rowlands paper which showed that a higher fat diet with a preload of carbohydrates, he’s dialled in his approach that Dan now feels works really well for him. He lifts his carbohydrate intake from the 80-100g he typically eats in the days prior. On the Wednesday (for a Saturday race), he will include additional potato or sweet potato in his evening meal, taking him to ~125g carbs per day. This increases to ~175g per day on Thursday and Friday (the two days before the race) – including fruit alongside the potato or sweet potato. In addition, he makes sure snacks etc on hand are low carbohydrate so not to be caught out during the lead up period with having to rely on the petrol station or four square options. If you do have to rely on these, and are looking for lower carbohydrate, then biltong, cheese snacks, even lower carbohydrate protein bars can be good stop gaps. On race morning before Dan’s Kona race he opted for was porridge: oats with a bit of Super Starch added, which is a slow release carbohydrate to not inhibit fat burning, and is a higher molecular weight carbohydrate, so it is easier to digest. Despite research studies in this area using a ‘train low glycogen, race low glycogen’ model to determine the efficacy of a LCHF approach for sports performance, in practice Dan follows what practitioners advocate: a ‘train low, race high’ model. Ideally, the train low approach has enabled you to increase your efficiency to burn fat as a fuel source in addition to using carbohydrate that you have stored or take on board, thus maximising the amount of fuel you have available. Dan takes in around 50g carbohydrate per hour; because he is very efficient at burning fat, he doesn’t need as much carbohydrate as he would otherwise. A real benefit of this is that it minimises the likelihood of gut issues many endurance athletes experience during a long event – the more carbohydrate fuel you have to take on board, the more opportunity there is to get the dose wrong. Importantly though, the more fatigued you become, the more your body will divert blood supply away from the gut to the muscles, and thus impacting on your ability to digest the fuel. During Kona Dan used energy blocks with gels on the bike, and a couple of gels with some swigs of sports drink or coke during the run. His paper Different Horses on the Same Courses outlines how to take this individualistic approach to fuelling, as will his online course that you can sign up to by clicking here. Finally, post-race, Dan gets back on board the LCHF approach fairly swiftly, as he has seen the impact that a higher carbohydrate fuelling day has on his blood glucose level across the course of the following week. It certainly doesn’t reduce down to normal levels the day after, and it’s likely that inflammation and muscle damage impacts on this too. Your best bet is to (as soon as possible) get back to your LCHF diet and help your recovery process. Whilst LCHF is increasingly more accepted in the endurance space as part of the approach, what about at that top end – does it limit performance there? There is very little quality research on this, however Dan’s research group found that there was no detriment to perform high intensity intervals (as I blogged about here), but the jury is definitely out on this point and I wonder if, like many things, it is individual. A person’s ability to metabolise fat as a fuel source and use it at a higher intensity is trainable for sure (that’s what fat adaptation is all about), but there could be individuals who are less able to produce ketones to be used for energy – this is speculation though on my part. Yes, there is a down regulation in pyruvate dehydrogenase which helps turn stored carbohydrate into glucose for energy, however the importance of this is questionable given the increased availability of fat for fuel, and there may be other enzymes upregulated to counteract this change in the fuel use. A potential way around this issue (and to ensure glucose metabolism is continued on your LCHF approach) is to do higher intensity efforts in training that force liver to convert glycogen to glucose – thus keeping glucose oxidation pathways high. I’m also beginning to recommend that people take on a small amount of glucose pre-high intensity sessions if they are beginning the fat adaptation phase during a training cycle that incorporates higher intensity efforts. Ideally your fat adaptation phase will occur during base training when we can keep intensity low. But that isn’t always possible. Fifteen-20g glucose prior to training for these high intensity sessions can keep output high but is unlikely to be enough to “ruin” your adaptation process. Again, there is no research behind these numbers, but from a practice perspective I’ve seen this work well. Finally, you know I’m an advocate of ketones to help support training whilst lower carbohydrate, and it certainly has helped me and many of my clients. We don’t at this point know enough about ketone utilisation in the body and whether taking exogenous ketones downregulates the body’s ability to produce them. This is an emerging field we are looking at with interest with regards to dosage, timing, type of ketone supplement etc. There has been decades of research into carbohydrate as a performance enhancer, and we can probably expect that it will take a few years of research for these questions to be answered in the science research space. Trying them yourself is likely the best approach to see how they impact your own performance (and I can help you with that). Love your coffee? Here’s another reason to pour yourself a cup. A recently published study should the consumption of a dark roasted coffee brew (500ml) daily for one month resulted in a 23 percent reduction in DNA damage to white blood cells compared to baseline levels. The protective feature of coffee is thought to be the polyphenols that are found in coffee. These bioactive ingredients (such as caffeic acid, catechol, hydroxyhydroquinone, trigonelline and the alkylpyridinium compounds) have been studied for their antioxidant and anti-inflammatory properties. They are able to mop up reactive oxidative stress (ROS) molecules that are the byproduct of metabolism. Obviously a small amount of ROS is necessary, however too much can overwhelm our anti-inflammatory and antioxidant system, causing increased inflammation and the reduction in the ability for these pathways to function, causing DNA damage. DNA damage accelerates ageing and is the underlying cause of the growth of carcinogenic cells in the body. It leads to telomere shortening – telomeres are like small caps on the end of your DNA chromosomes, protecting them from damage, and are used as a biomarker for ageing. The study was a randomised controlled trial; therefore, it is able to establish causation (unlike a lot of nutrition research, which is largely observational in nature).It is consistent with other studies that show a reduction in DNA damage after even short term exposure (such as this study, where healthy volunteers showed a reduction in damage after only 2h of drinking coffee). The current research was conducted in both healthy men and women, and the 500ml of coffee per day equated to around 372mg caffeine daily – equal to around four cups of espresso. That sounds like a lot of coffee (and it is!) however this is consistent with other observational and clinical trial research that has shown a reduction in cardiovascular disease risk, cancer incidence and all-cause mortality for people who habitually consume around 4-5 cups of coffee per day. This latest study adds to a body of knowledge regarding the health benefits of coffee. The polyphenols mentioned above help protect us from type 2 diabetes, stroke and cardiovascular disease, with improvements being seen in glucose and insulin metabolism (important for blood sugar control), blood pressure and markers of inflammation in the body. I’ve talked before on the health benefits we see in coffee, and though this is great news for coffee drinkers, let’s not forget there is a fairly substantial proportion of people who are sensitive to the caffeine in the coffee and can’t tolerate its stimulant effects. Caffeine is metabolised in the liver, with the CYP1A2 enzyme responsible for detoxifying most of the caffeine. Our ability to produce this enzyme is coded by our genes, and there is variation as to how active this is for each individual. Those that have an active gene are able to metabolise caffeine efficiently, therefore the stimulating effects of caffeine are mild and short-acting. This may affect their enjoyment of caffeine and clearly their ability to tolerate it. The opposite is also true – someone with reduced activity of the gene will metabolise caffeine more slowly and its effects will be longer lasting and more noticeable. You can find out your genetic ability to tolerate caffeine through a Fitgenes DNA test(PM me for more information). In addition to the genetic differences, environmental elements also influence our ability to tolerate caffeine. Even if you are a fast metaboliser, stress and lack of sleep can impact on caffeine’s effects – ramping up cortisol levels and with it anxiety and blood sugar dysregulation. Three coffees a day when on holiday and in a relaxed state may not be a problem, however when a work deadline is looming and you’ve been running on little more than petrol fumes rather than sleep, it is a different story. With the present research, as the health benefits are from polyphenols present in the coffee, rather than the caffeine, the reduction in DNA damage may well be seen in decaffeinated coffee too, with previous research finding benefits with regards to type 2 diabetes and liver damage when consuming both decaffeinated and caffeinated coffee. has found health benefits from drinking this. However, without clinical trials to confirm this, at this stage it is unknown. We’ve got to be realistic – a good diet (and decent snacks) don’t happen by accident. These types of ideas take some preparation and planning. However I encourage you to do it as you are totally worth it! You know how bad you can feel when you eat something you don’t want to, but it was the only choice. Like that double-sized Kit Kat at the petrol station because you were starving and this was the first thing you could see and, hey, cheaper than the single sized one. 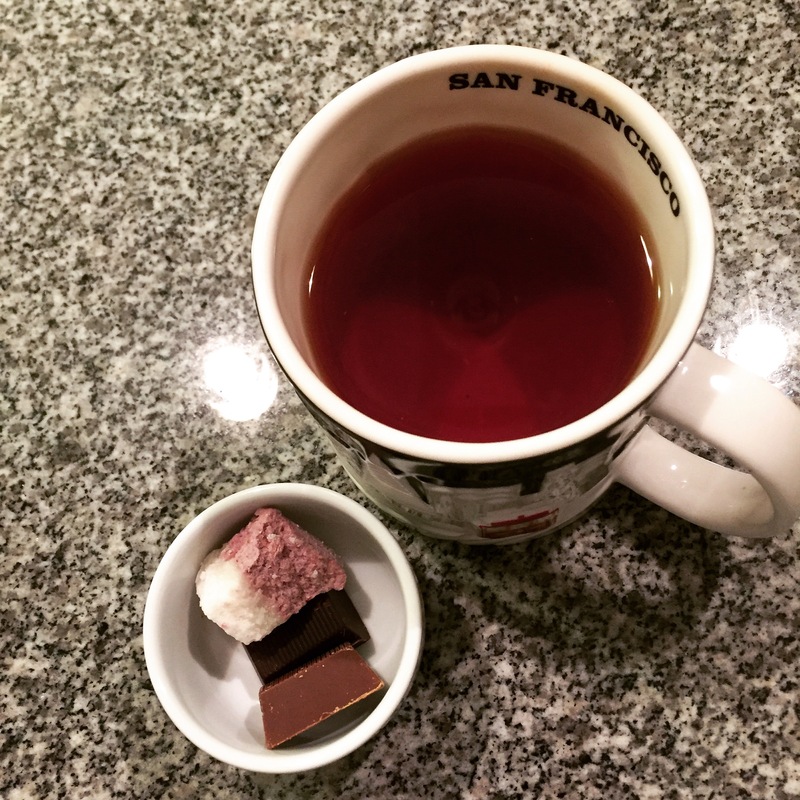 I’m talking chocolate, biscuits, chips, etc – high sugar, high fat high caloric and low nutrient foods. Sure, these types of foods aren’t ideal to consume on an everyday basis for most people, however no one food ruined your diet and subsequent health goals. It’s more unhelpful behaviours and habits that are driven by our physiological response to these foods. These ultra processed foods (combination of sugar, starch, vegetable oils) leave little work for our body to do when we eat them, meaning the starch and sugar hit our blood stream quickly. This increase in blood sugar will drive an insulin response that clears the blood of nutrients (sugar and fat), and takes it to where it’s required, or to store it for later use. The body prefers to keep things relatively stable, so if there is an excess of sugar in your bloodstream, it is going to be on it to clear it out. If you’re very active and eating for fuel, it will go to the working muscles. If you’re behind a desk on a standard work day, then it’s more likely to be the latter. That can happen at such a rapid rate that your sugar level dips below normal (an over-correction), sending stress signals to your brain to resolve the issue and bring your blood sugar levels back up to within normal range. Cue: hunger, potential light-headedness, loss of concentration and cravings for sugary or starchy foods – the foods your body knows will solve the immediate ‘crisis’. First: do you need to snack? If you eat three decent meals a day, you probably don’t and by decent, I mean meals that include a good hit of protein, some fat for satiety, may include some carbs (of good quality, such as kumara, potato, some fruit, dairy for the dairy tolerant) and an abundance of non-starchy vegetables. How much? Check out the graphic below. If you hit this and you don’t have high energy needs BUT still snack, think about whether it is out of habit or hunger? Habit can drive our appetite to eat almost as much as a physiological need for nutrients. And if you do need a snack? These snack options listed combine any carbs with fat and/or protein to slow down the release of glucose into the bloodstream and will help keep you fuller for longer. Perfect. These are from a FB post I put up last week, and a few of my own thrown in there too. Some are grab and go, some require a little bit of preparation to be ‘grab and go’, and some require a bit more time in the kitchen, but it will be worth it when you need something to tie you over. Homemade muesli (can be grain free, ideally minimal dried fruit) with unsweetened yoghurt and frozen blueberries. Low carb muffins (such as these sushi muffins) baked and kept in the freezer for when needed. Canned sardines/salmon/tuna in olive oil – drain, flake, add a squeeze of lemon – or just have as is. Mashed cheesy cauliflower (pre made, reheat) – such as this: if dairy free, use coconut cream instead of the sour cream, and this cashew cheese instead of the cheese. Slice of cheese, spread with peanut butter (I tried this, didn’t really like it, FYI, and I love both cheese and peanut butter). Nori sheet spread with tahini, miso, some avocado and sauerkraut. *I use LCHF interchangeably with ‘real food’ or ‘minimally processed’ as the reality is, when you switch out the processed, packaged food in your diet you will be lowering your carbohydrate intake. Anyway. I have been having a bit of a hankering for porridge – it’s cold and winter, after all. But I’m one of these people who, after having oats, has a blood sugar plummet within an hour – even with a decent hit of protein powder added which should help stabilise my blood sugars and keep me full. So over the last few years I’ve been having some porridge alternatives. Here’s five that I have found to be quite delicious that I mentioned on our Fitter Radio podcast. What this nutritionist ate on Wednesday. So after the Business Insider profiled the typical diet of a nutritionist this week, I got a number of people asking to see what I ate in a day. Happy to talk you through the photo essay that represented what I ate on the following day, a Wednesday. It’s a fairly typical ‘non-typical’ day for me. I have busy client days on Tuesday and Wednesday and if I’m not that prepared then it can end up a bit all over the place (as with most people). However I wanted to be genuine with it and not stage the perfect day. Because I don’t eat a perfect diet! Yes I follow the dietary principles that I advocate, but am pretty….normal?! If you follow me on Instagram then you’ve seen all of this before. What follows is going to be of no interest to anyone who isn’t interested in food or my general musings/setting the scene. A bit of diet preamble: I would describe my diet as low carb, healthy fat (LCHF). Not low carb high fat – the hangover from being an overweight teen/young adult and from preaching the low fat guidelines up until around four years ago. What does this mean? It means that if you come to my house for dinner then I’m unlikely to serve all of the vegetable dishes swimming in butter, cream, cheese or olive oil. In fact, that kind of grosses me out to be honest. You might get one vegetable side dish like this. I will also typically drink my coffee black unless I feel a bit on edge for whatever reason, and I will have it with cream – I’ve tried to find some literature to support the idea that cream dampens down the cortisol response of coffee (which makes sense to me, as caffeine and other constituents of coffee stimulates insulin and cortisol) but have yet to do so. It also means that I no longer freak out if someone serves me a meal that DOES have the vegetables swimming in butter or coconut oil (and I will probably like it). It means that I cook curry-type meals with coconut cream and not yoghurt, that I am no longer afraid to use more than a teaspoon of coconut or olive oil when I cook, that I add fat to my salads by way of mayonnaise or pesto. That I snack on cheese and that I add nuts and seeds to salad. That I don’t purposely buy food that has had the fat removed. This may not be your LCHF diet, but for me it’s the healthy addition of fat in normal amounts (on my plate at least). If I was keto (as I have been before) then clearly this would be different. It’s funny, there’s always backlash when I post a food that is (naturally) low in fat from the hard-out LCHF’ers. I use my ‘I know better than you’ nutritionist stance to remind them LCHF is a dietary pattern, not a food category. It doesn’t mean that every food you eat should be low carb, high fat. I prefer fresh and crisp, light and colourful, and I probably eat more of a ‘Zone’ type diet actually (if I was going to ‘label’ it in regards to macronutrient content). I haven’t put my food intake into an food database analysis to check this – but in my job you pretty much know things like calories, fat, protein, carb content of what you eat. 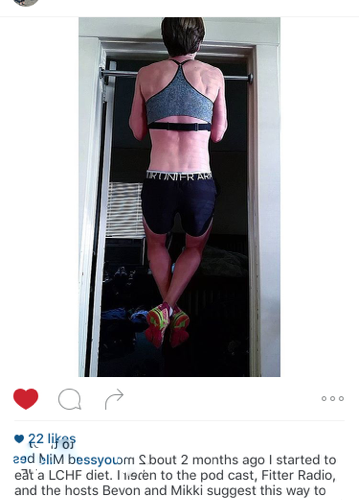 Just like a personal trainer knows what muscles they are working when they do a set of mountain climbers. You don’t need a database to tell you the basics. A tribute picture…forgot to take one at time so I staged this. You get the drift. Up at 4.40am (yes, early! I channelled my inner elite athlete or morning radio host here) to do a longer run before an early client. I had a coffee (instant – Moccona. I have a Nespresso that sits on my bench that gets little use) and some coconut butter. I don’t always eat before a run, I base it on how I feel more than a schedule as such. Sometimes I eat before an easy run, sometimes I go fasted before a long run. 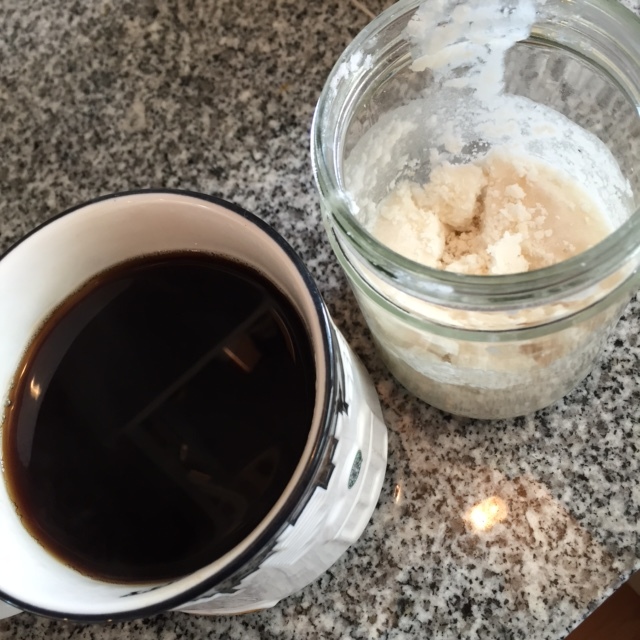 I have coffee before a long run or a harder effort, and sometimes I have a teaspoon of coconut oil with the coffee. Alongside it, not in it. Not tablespoons of it blended with butter and labelled ‘bulletproof’, just a small amount. Perhaps more psychological than anything else. FYI this run isn’t a ‘long run’ in runners terms, but as I’m building up from Gold Coast many months ago, it was longer than normal. Sometimes I put psyllium husk in it. Not today. It’s v cool to ensure your feet are in pictures too right now. 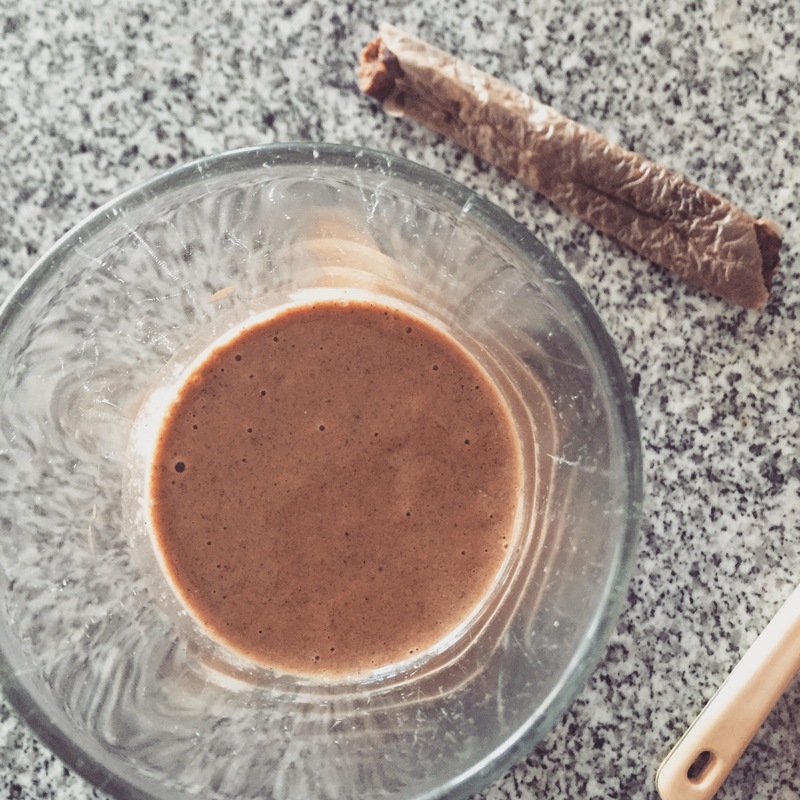 This is coffee – my travel plunger from Kathmandu that I’ve had for years AND LOVE IT. Yes it probably contains enough caffeine for 4 shots in here (!) but it is actually just for me. Sometimes I finish it, sometimes I drink just half of it. My question is: if it was meant for more than just one person, why put a sipper lid on it?! This coffee experience has ruined others for me though, as I demand a strong coffee, and like a lot of volume. Alongside this is a grapefruit custard thing that I’m testing as part of recipe development for my online nutrition coaching members. ½ grapefruit, an egg, ½ cup coconut milk, 2 tsp Great Lakes gelatin, 1 tsp psyllium husk. I also had a hardboiled egg alongside it. And (not shown) ½ a Canterbury bierstick (sorry I ate that before I photographed it). FYI The Canterbury brand has no nasties and, while sugar is in the ingredients, it is minimal – maybe 1.3g per 100g. Off to the Go Healthy Superfood launch. Get handed a smoothie tester made by one of my food heros Kelly Redmond (bonnie delicious blog). We have bonded via Instagram over a shared love of nutrition and health podcasts and she is as much of a geek as I am. 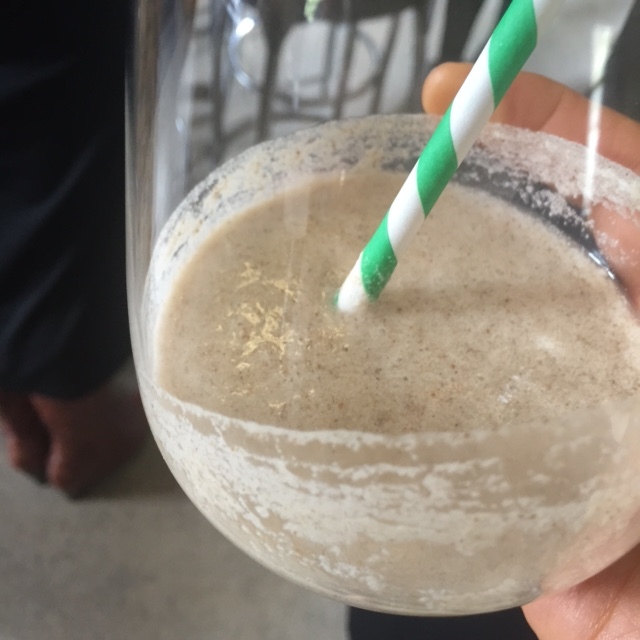 The snoothie had cacao powder, date, almond milk, coconut water (I think?) and possibly another superfood super powder. I have about half of this. I’m not that enamoured by coconut water actually, so just put it to one side. I also have a couple of glasses of sparkling water. 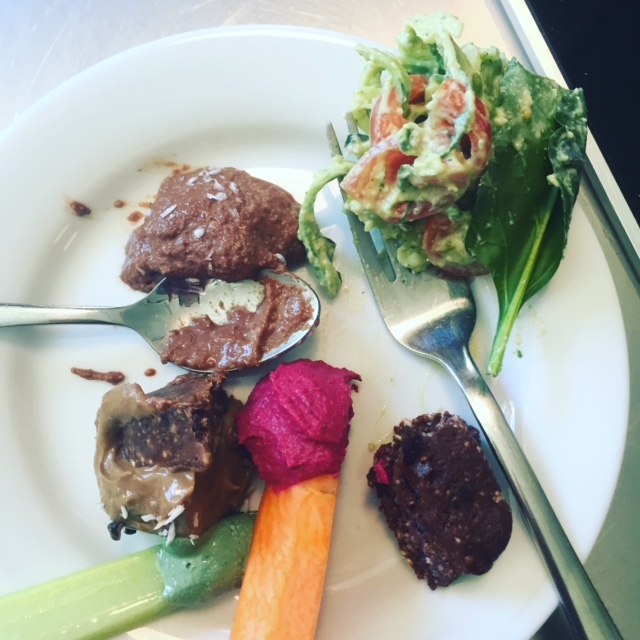 We’ve got zoodles, vegetable dips, raw cookie, a cacao brownie and some chocolate mousse. The recipes that we made as part of the launch. A tasting plate and there is no size distortion in this picture. It’s a small plate. FYI recipes developed by Kelly and Mon from The Snack Pack – she’s the creator of Amazeballs and has made a lower sugar Amazeball (a woman after my own heart). I’m not a big fan of raw treats that are heavy on honey, dates and the like – obviously from the ‘health halo’ perspective of ‘no added sugar’ but I’m mentioning it here not from a zealous nutritional stance, but just a taste preference actually. Another cup of water. Back up to the clinic in Ponsonby to have a quick snack before clients. 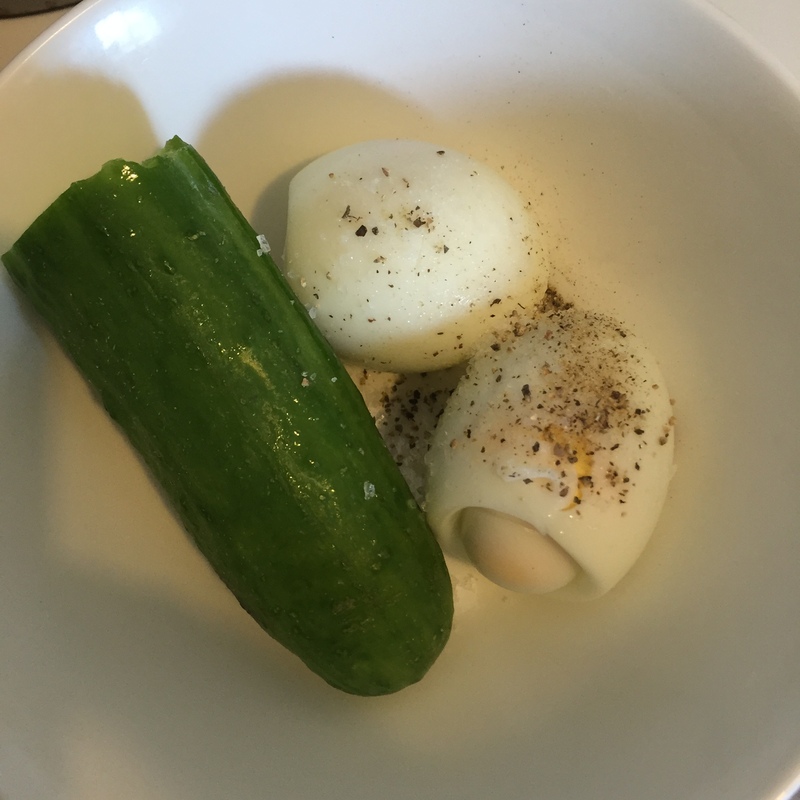 Have a small cucumber with a couple of eggs. I also have a glass of water here. Normally I would have a salad actually, but I wasn’t sure if the launch was going to be lunch, or if it was going to be smoothies, or completely sans food, so I prepped some additional food just in case. Yes, those counting would see this is four eggs in one day. I don’t always eat four of them (as I try to vary my protein), however I do love them and they are super easy to just eat like this, so it’s not a major. This isn’t ‘lunch’ per se as it’s not big enough to be a meal – more like (along with the tasting plate and below) one of a series of snacks. I meet friends for a quick drink before dinner. 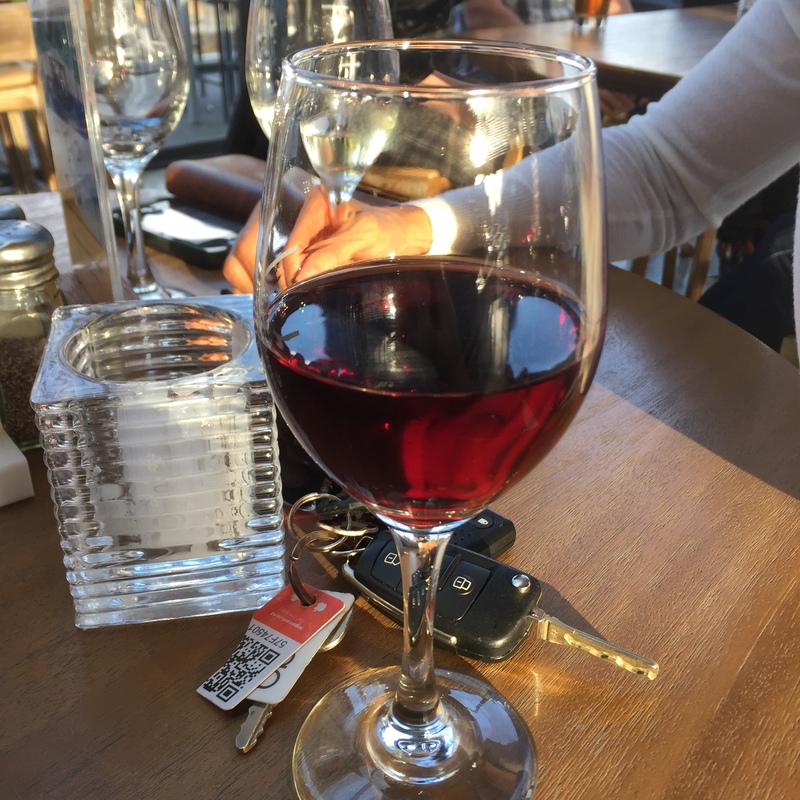 I generally have 1-3 glasses of wine across the week. Not normally on a Wednesday. This is pretty standard and I love eating like this. 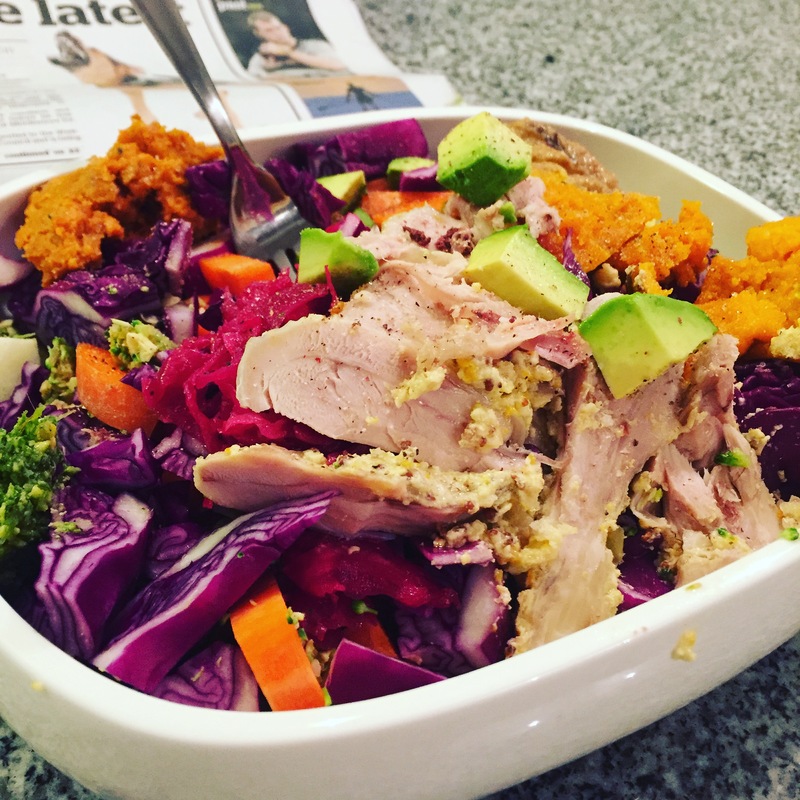 Leftover chicken with assortment of vegetables (brussels, carrot, pumpkin, tomato, zucchini, red cabbage, avocado, almonds, carrot dip and babaganoush (both homemade), homemade mayonnaise and Be Nourished Ruby Raw Kraut. If not chicken (and rarely chicken breast) then it will be beef (mince, burgers), salmon (smoked, fresh), pork (belly, mince), lamb (roast, mince), liver (chicken or beef). I very rarely have vegetarian meals (unless doing some recipe development) and my days at Weight Watchers has put me off The Stirfry for life. It would be a rare event where (at home) I wouldn’t have a salad of some description. Weirdly I wouldn’t have canned salmon, tuna, eggs or sardines for dinner. Nothing wrong with that though – it’s almost like they aren’t on my radar past lunch. Of course if you serve them to me as part of a meal then I’m sure I will enjoy it immensely. I don’t often have steak as I have little confidence around cooking it. 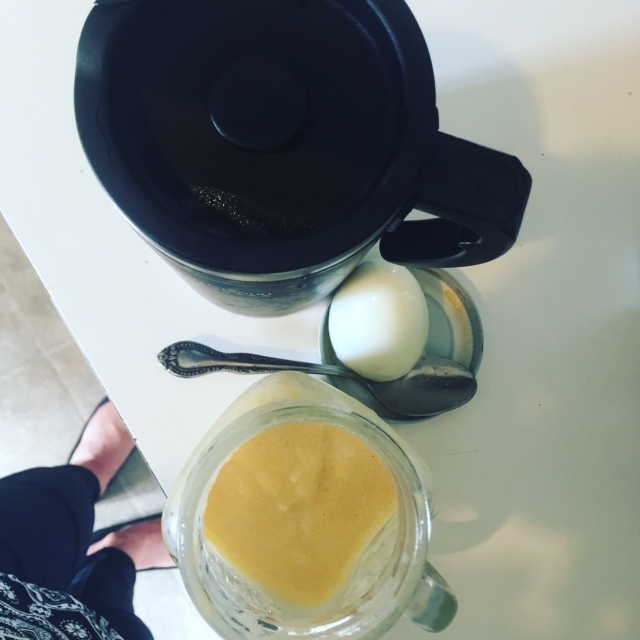 I’m no chef – more a food hack. After dinner treats. 99% of the time I eat a sweet treat after dinner because I enjoy doing it. This is a couple of squares of chocolate and some leftover genuine sugar free treat I made which is seriously delicious. I would often have some peanut butter and coconut after dinner if not chocolate. Yes that is a Starbucks cup. A different one from the one at the start of the day. I love these as they are big and hold a good volume. And cute too. I have a San Fran, a New York and a Los Angeles one. Your better sources of carbohydrate are always the starchy (potato, kumara, peas, corn) and fruit as opposed to pasta, bread, crackers etc. Your requirements for this are on a sliding scale from ‘none’ to ‘fist- 2 fist size’ depending on activity, metabolic flexibility (ability to burn fat as a fuel source), metabolic health, energy, mood….